“I make paint from rocks…” A typical encounter. Click HERE to go directly to my online gallery. All of the work you’ll see there uses paint made from rocks. Click HERE if you want to see Paleo Paints at Etsy. And HERE for workshops on making them. 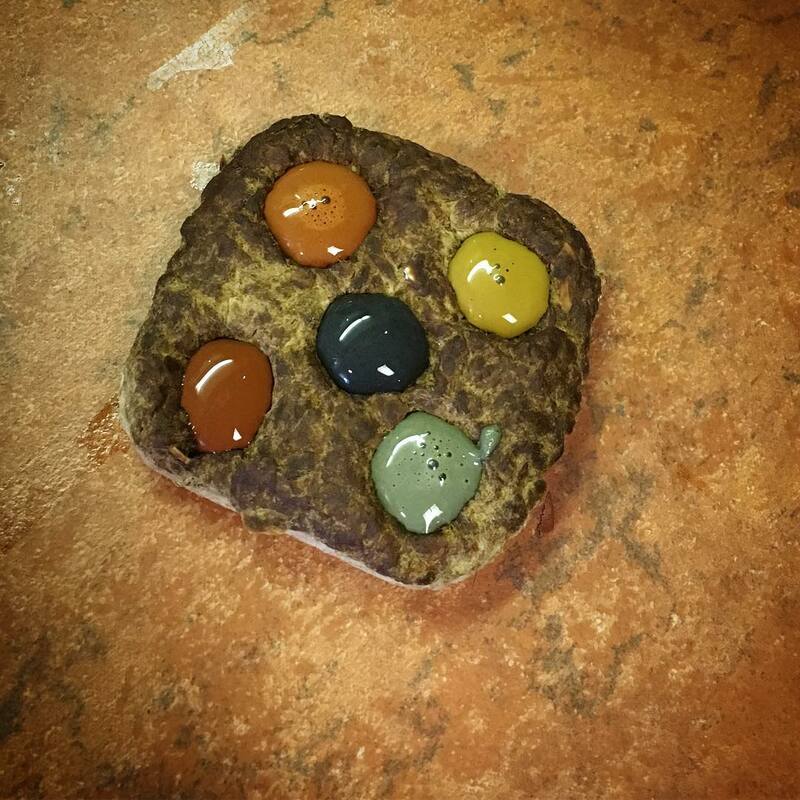 When people see my artwork, they usually don’t realize the colors they’re seeing is paint made from rocks. I love the surprise I invoke when I tell them that. It makes for interesting conversation with almost anyone even remotely interested in nature. During winter months I get to talk to people at the Fayetteville Farmer’s Market. From spring through fall, I’m usually at the gallery in Kingston, and that’s where I get to talk to people. Usually they’re visitors to the area, passing through on their way to or from the Buffalo River or out to see the elk at Ponca. To see what other venues I’ll be at this year, check out my online calendar. And Wild Ozark is always ‘open for business’ at our Etsy shop. People come in through the doors, walk through the aisles, sometimes browsing the various offerings. At the farmer’s markets, some of them, regulars who come for specific things, walk right past other vendors as if they don’t even exist, making a beeline for the booth that carries their (usually) gastronomical delight. Some market-goers glance at everything they pass, just to see what’s new. At the gallery, it’s a little different because mostly all there is in there to see is art of some sort or another. Finally I notice a person who’s eyes linger on my artwork. Usually i don’t pounce right away. Pouncing is not my style. I let them look for a little while. After a few seconds more, I know they’re interested and I will try to strike up conversation if I’m not already involved with someone else. “Oh that’s nice.” And then they’ll either step away because they’re afraid I’m going to try and sell them something, or step closer. Most become more interested. So I give more information, little bits at a time until they’re really engrossed. Then most of the time, the interest really flares. Oh? Their eyes light up. Now this is something they’ve never heard of, and if they step in to hear more, I’ll come around and go through the show and tell of how I gather the pigment rocks, crush them and then make the paint. I get more satisfaction out of showing and telling about the beautiful colors than I do from trying to ‘sell’ art to them. The idea that I can get paint from rocks is still so fascinating to me that I like to share it as much as possible. But when someone walks away from my booth, treasure in hand, it is also very satisfying. The most favorite interaction comes from meeting those I follow or who follow me via this blog or other social media. They already know I make the paint from rocks. They’ve made a special trip to see my work or to meet me. It makes my most of the time otherwise slow day when one of these market-goers shows up. Even if they only came to look and don’t buy. I bring whatever paint sets are available with me to markets, but they’re also at Etsy. Here’s something new I’m working on. This is the prototype, called a Paleo Biscuit. What is that? It’s a palette to hold paint. I made them from recycled paper and I hope to use them to replace all the plastic pans eventually. The idea of using flat rocks themselves as palette trays is also on my list of things to try. The wood palettes are nice, too, but those I have to hire out, whereas I can make these paper ones by myself. Another thing I especially like about them is that they’re plastic-free, use recycled materials, and the base material (paper scraps) is freely available. Most of my work is uploaded to Etsy when it’s ready to sell. These awesome stationary sets, all works derived from my paint made from rocks, are the most recent addition! Inside the envelope there’s a liner with image. Cute little fox peeking out. Three sets so far, more to come. To see art works as I do them, follow me at Instagram. To see them when they’re finished, keep an eye on my Paleo Paints website. I do bring some originals with me to the market. The Twisted Tree swatches and other small originals are usually for sale, but I’m holding on to most of the birds of prey originals now. I need to build a large enough collection of them to enter into exhibits or shows. I almost always have prints of everything available at my market booths, but email me to make sure the one you want is ready, if you want to be sure of a certain painting. Even if you’re not looking to buy anything, come out to see what incredible art and colors come from our Ozarks. I still find it fascinating, every time I make paint from rocks. I usually do a good job of keeping my online calendar updated, but here’s the highlights of the months to come.